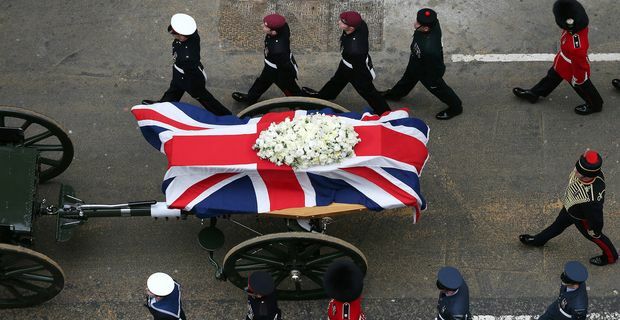 The English establishment turned out in force for the funeral of their heroine, Margaret Thatcher. It was a state funeral in all but name, with all the pomp and ceremony and reverence usually reserved for royalty, but did not pass off without opponents expressing their contempt. The Telegraph retorted that riot police had to hold back protesters as the funeral cortege reached St Paul’s and there were several protests and dissenting banners along the route. The coffin was carried on a gun carriage to St Paul’s via the Strand, Temple Bar, Fleet Street, Ludgate Circus and Ludgate Hill, after leaving the chapel of St Mary’s Undercroft by hearse. The funeral service included a reading by the Prime Minister David Cameron, who had earlier suggested on BBC Radio that "we are all Thatcherites now", and an address from the Bishop of London, Richard Chartres (during which the Chancellor George Osborne appeared to shed a tear). Maintaining the ceremonial atmosphere, there was a considerable military presence along the route. Force of arms had been a defining characteristic of the Thatcher Premiership, from Cold War rhetoric to the Falklands Task Force and the crushing of striking miners in pitched battles across the North. There were regular reminders of Thatcher’s capacity to create dissent and division. Two protesters carried a banner reading : "I’m here for the people she killed through poverty, despair, policy and war." At Ludgate Circus several hundred people turned their back on the procession, chanting "what a waste of money" and "Tory scum". The protests did not descend into any undignified skirmishes. Melanie Phillips, the strident tabloid columnist put the opposing view from the Tory shires, "Today we are somehow burying England," she tweeted. Thatcher was cremated but Phillips wasn’t going to let facts get in the way of her rhetoric.